All of our BlackBerry devices are fully unlocked and sim free for all UK and International customers. You can even switch up your sim or service provider at any time as the handsets will remain unlocked. International and worldwide delivery is generally within 1-2 working days via FedEx, with full 24 month warranty. Don't forget if you're purchasing outside the EU you'll pay the Ex-VAT price. 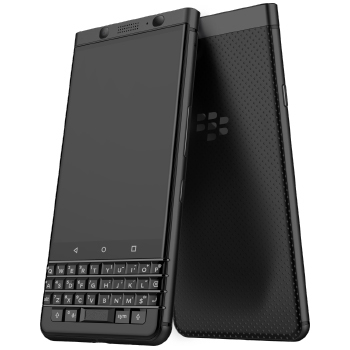 Offering a 4.5-inch HD (720p) scratch-resistant display, above the iconic BlackBerry QWERTY physical keyboard that you can now program to instantly bring up contacts and apps you use most often (such as pressing “B” to open browser.) Contextual auto-correction, next-word prediction, personalised learning engine, Flick Typing and Touch navigation responds to touch gestures like a trackpad and the 52 keys can be programmed to support a shortcut with a long-press. Upgraded to 4 GB RAM and 64 GB Flash and expandable memory via hot swappable microSD memory card (Up to 2TB) allows you to stay fast and store all of your data on the go. Secured with BlackBerry DTEK security software, the world’s most trusted mobile security software. Powered by Qualcomm® Snapdragon™ 625 Octa-Core 2.0 GHz, 64-bit Adreno 506 and 650MHz GPU, the BlackBerry KEYone will run on the latest Android 7.0 Nougat straight from the box. The BlackBerry KEYone is one of the most secure Android smartphone, thanks to the DTEK security monitoring app offering Best-in-class monthly Android security updates and Security built-in from the start. With a Fingerprint Sensor inbuilt into the Space Bar of the QWERTY keyboard, your data is safe and secure on the go. You’ll receive monthly security updates - free to download – and the DTEK security app comes pre-installed on the device. Housing the Sony IMX378 Industry leading camera sensor on the KEYone Black Edition delivers sharp, crisp photos in any light. The 8 megapixel Fixed-Focus front camera offers f2.2, 1.125um pixel size and a 84˚ wide angle/field of view lens for the perfect group selfie. The 12MP auto-focus large pixel rear camera offers 4K video recording at 30 fps and Phase Detect Auto Focus (PDAF), Fast focus lock HDR 6-element f2.0 lens, Dual Tone LED Flash and 4x digital zoom.